Once you've tried the main katakana page, try these katakana games! Now try the Talking Katakana Games! If you teach English, there are similar games for English letters! 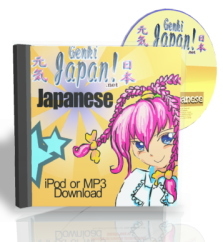 Also be sure to check out the talking "Japanese Words" page and my Hints & Tips page. There are loads of great resources out there, and one of the good ones is the "Pimsleur" series. They have a "Quick & Simple" starter pack and also a full on "Gold Course". They are well recommended if you want to learn Japanese, in January I used it to learn everyday Spanish in a month! Or for slightly cheaper, but one that requires a bit more work, you can have a look at the Living Language series. Although now I would prefer the Pimsleur course above, I actually used the Living Language series myself when I first learnt Japanese. It's good, but you have to keep repeating and repeating the same CDs, whereas the Pimsleur makes you think more, and reviews the language as you go along. All the Japanese on this page is suitable for either guys or girls, and is pretty normal, everyday Japanese. This means it's not too formal, but you'll be fine as long as you don't say it to anyone too posh! 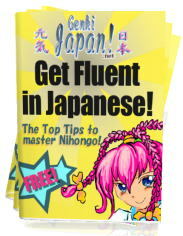 Also have a look at hints and tips for becoming fluent in Japanese page!